About a month ago, I had a minor spill on the way to uni and came off at just under 30km/h. I hit the ground quite hard and got some road rash and a chipped tooth. Apart from that everything was okay. I then got up to check the bike, and was absolutely amazed that the front fork had completely sheared in half, halfway down the fork blade. 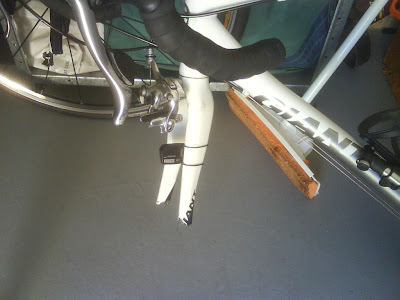 The top of the fork is still attached to the headtube and steerer, whilst the bottom half is still connected to the dropouts on the front wheel. You can read the full story over at the Cycling News Forum. From the OP's thread (later pages where he describes his fall): 1) he had his hands off the handlebar, 2) he chipped his teeth, 3) front wheel suffered no damage. Based on the evidence, it sounds like at some point when the rider lost balance, the fork/front wheel was turned 90 deg causing violent lateral stress. The wheel looks like a Mavic Aksium which is actually quite robust given its spoke count and heavy-ish rim. 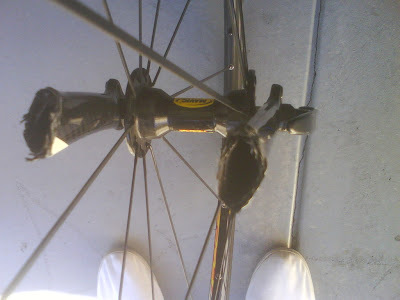 So as the front wheel held up, the fork blades snapped in the lateral direction, which most (carbon) forks are not designed for. (They are primarily designed for longitudinal and frontal stress - holding the bike up and handling impacts such as potholes, and stress from braking.) 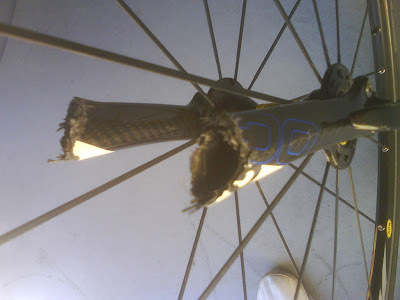 While I would agree that a stronger, more robustly designed carbon fork would not have broken in this way, it is not unreasonable if indeed the front wheel was suddenly cocked.